Production began in March 1962 for the new flagship of the range, the TV175. 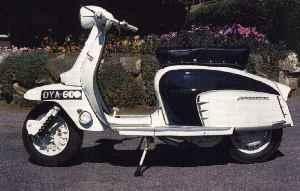 The new "slim style" range of scooters from Innocenti featured narrower body work then the out going series 2 models, new sleeker side panel with a raised band in them replaced the bulbous old model ones. Slimmer leg shields, rear floor boards, front mudguard and headset. The headset featured a hexagonal light rim, with a new shaped speedometer, the lights were mainly controlled by a multi position ignition switch, with only the dip and main beam on the handle bar switch, along with a button for the horn. The front mudguard was made from fiberglass, possibly in a bid to save weight. The TV was also the first production two wheeled vehicle to gain a disc brake, this was made in a joint venture between Innocenti and an Italian company called Campagnolo. Engine wise the TV175 received a new smaller SH/1 series 20mm carburettor from Dell'Orto, improvements to air flow, porting and exhaust, all saw the power up slightly at 8.7bhp. New larger engine mounts smoothed the vibration, although not completely as often new machines would vibrate on tick over. Again mid production changes took place with the early ones having the raised band type panels, with the later ones gaining a more rounded looking panel with three fingered flashes set into the recess of the panel work front and rear. Early colour options of white, and white as a main colour with either yellow or orange as a second, on the horn cast and mudguard, were some of the many colours now available. Further two tones of light grey/dark grey and ivory/coffee were available, with the later models being offered in white or metallic blue. The metallic blue ones gained their own metallic blue rear frame badges. In October of 1965 the T.V 3 175 came to an end with only 37,794 being built, not quite matching the Series two's figures due to the arrival of the new flagship the, T.V. (G.T.) 200. It was the power mad British who eventually brought the 200cc into production. Peter Agg, Managing Director of Lambretta Concessionaires Ltd. in the UK, went to Innocenti to ask for a larger machine, needed for more top end speed. He was refused being told that they were not going to manufacture larger engines, if the British wanted larger machines, they should buy motorbikes. But Peter Agg persisted and eventually Innocenti decided that the British could have the larger capacity, but Concessionaires would have to cover the warranty as Innocenti did not approve of the model. And so the 200cc became available, a normal 175cc machine, with slight alterations to the crank casing mouth, and bored to 198cc everything else as it left the factory. The 200 was a success, with great acceleration and a top speed never seen before, but then the problems started with engine mounts that couldn't cope and exhaust that kept falling off. These problems were resolved by fitting two blocks either side of the mounting and another bracket to the silencer, and the rest of the world soon learned that the British had their own machine, with demand forcing Innocenti to produce the T.V. proper. All the modifications of the UK machines were kept, along with different gear ratios and updated carburettor, all improving power output to 10.75bhp giving 70mph. The T.V. 200 was sold in France, Switzerland, USA, Scandinavia and the UK, but strangely not in Italy, making it a minor sales success with 14,982 being built in the short production run that ended in October 1965. Again sharing all the mid production changes of the smaller T.V. 175, the 200 was known in the UK as the G.T. because of the trend in cars being named G.T. or Grand Tourer.